Kindness Revival: Why don’t churches preach compassion for animals? From the earliest days of the Puritans, the animalwelfare movement in America, like so many other movements of liberation and social reform, was driven by people of faith. But in our own time, mainstream religion has tended to ignore our fellow creatures. In our continuing series about animals in religion, Best Friends executive director Paul Berry, who grew up in the evangelical Christian tradition, argues that it’s time for the church to recapture the initiative and treat kindness to animals as one of the moral imperatives of our time. When I was four years old, I saw someone do the unthinkable – something so wrong that I blocked it from my memory until my brother reminded me about it years later. We were at our house in New Orleans, playing under the carport with some puppies our dog had just had. She was a street dog, a sweet stray we’d named Skipper. A man and a woman were arguing nearby. Visibly angry, the man got in his car and sped down the driveway. But the man was upset and mad, and he went anyway. He knowingly ran over three of the puppies. That man was my father. He was a troubled individual, and I’ve long since forgiven him. But such displays of rage and violence are scattered throughout my childhood memories. Thanks to my mother, I don’t look back on my youth with any grief or sadness. She did a good job of making us kids feel safe and loved. A devout Christian woman, she introduced us to faith and prayer as a refuge for our struggling family. She upheld the life of Jesus as the ideal role model: courageous, kind and merciful. Mercy and nonviolence came naturally to us kids. My brother, sisters and I were always bringing home some lost pet or other. Seems we always had a house full of animals, and everyone was considered part of the family. He was fun to watch, but he also had an empowering message of hope and personal transformation. And being my father’s son, I needed to believe I could find goodness in myself. With all the spiritual influences around me, I came to believe that you could create that goodness in yourself by doing good in the world – caring for all that God has given us: the animals, the Earth, and each other. 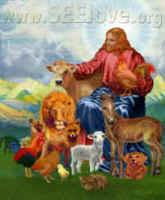 But I can’t say church leaders helped shape my reverence and respect for animals and nature. That was personal. Today, with kids of my own, I’m convinced that we’re all born with an innate sense of reverence and responsibility for animals and the earth; kids just need reassurance from their parents and role models. It’s also clear that the concept of caring for all of nature is becoming more and more a concern for people all over the country, regardless of their faith or philosophy. That’s an astounding consensus. But how does it relate to people of faith? In an informal survey of Best Friends members following the national poll, we asked them what their churches, temples and synagogues are talking about with respect to animals and morality, and how their religious leaders are teaching their congregations to act on those. The answer: Beyond the human species – ourselves – God’s creation is barely talked about at all. So if this moral obligation toward our fellow creatures is such a core moral value for people, why isn’t it upheld by our churches? The evangelical movement prides itself on taking strong positions on moral issues. And congregations look to their churches for leadership. But the churches aren’t setting much of an example on the subject of kindness to animals. So is it any surprise that we’re not seeing much follow-through from the congregations? For myself, I long ago gave up even expecting to hear anything meaningful from the pulpit about the importance of protecting animals. And many people I used to go to church with and still meet up with occasionally tell me the same thing. We want our children to grow up in the church, but we want it to address all aspects of moral responsibility. And if most of us are indeed born with an innate, God-given sense of moral responsibility, then surely it is the church’s business to foster this responsibility and remind us of it into our adulthood. Instead, it all gets lost along the way. Worse, many of our members told us, their churches have become so politically organized, so focused on narrow wedge issues, that they have pretty much lost sight of the big picture stuff – universal kindness, compassion, mercy and nonviolence. So it should come as no surprise that when the churches start leaving their congregations, the congregations start leaving the churches. The Washington Post reported last summer that since 2000, more than 20 million Americans have left traditional churches to explore alternative venues of worship, including home churches, workplace ministries and online faith communities. And in early October, the New York Times reported that evangelical Christian leaders are warning one another that their teenagers are abandoning the faith in droves. The founders of Christianity had a bold vision for a universal church built on the Golden Rule as spelled out in the Beatitudes. But with so much of its focus on issues that have more to do with Caesar than with God, much of the church that I grew up in has lost its sense of divine mission. That mission should be to care for all creation: the animals, the Earth and each other. And if more Christians demanded that level of moral scope of their leaders, the church would be out in front on causes that relate to the animals and nature, ranging from environmental protection to animal welfare. Just for starters, we should be demanding no-kill policies for homeless animals in our communities. And we should be fighting against the fur trade, factory farming and sport hunting, too. Those are profoundly immoral and sinful enterprises – meaning that they are about inflicting suffering and death upon God’s creatures in pursuit of nothing more than human vanity, profit and entertainment. But there’s not nearly enough discussion in church on these issues, and certainly not enough encouragement to go out into society and campaign against such injustices. People want to have those meaningful conversations. But in the follow-up to our national survey last year, we learned that most people of faith who are practicing compassion for animals are doing it in spite of the message they get from their religious institutions. In the last few years, many advances for animals have been made in the political arena. And much of that progress has been driven by the animal rights movement. As a result, Congress and local politicians are increasingly sensitive to the concerns of people who care about animals. But meanwhile, the churches continue to treat concern for animals as a non-issue. Worse yet, the world of animal “rights” is often shunned by the evangelical movement as being “liberal” – even atheistic. It may be true that some of the early adopters of the modern animal rights movement were non-religious – in some cases, even anti-religious. But much of that has to be seen in the light of the shocking lack of interest from the churches. “We may pretend to what religion we please, but cruelty is atheism. “We may boast of Christianity, but cruelty is infidelity. More than ever, it’s time for people of faith to take ownership of the animal cause – if not necessarily as an issue of “rights,” then certainly as one of core spiritual values: kindness, compassion, mercy, nonviolence and love. For many of us, it is easier to promote rational arguments for animal justice. But, in the final analysis, our motivation is about something entirely irrational: love. We love them as our family, and they love us back unconditionally. Is there any cause more noble for the Christian than to honor the blessing of love in this life? You can join the continuing discussion at www.network.bestfriends.org/religion.